This survey involved volunteers visiting ‘random’ (i.e. pre-selected) 1-km squares throughout the UK in order to record the occupied nests of House Martins. By surveying random squares, we were able to assume that our results were representative across a wider area, in order to produce a robust population estimate against which changes in the future can be measured. Volunteers carried out at least one visit to 2,934 squares within the UK. Online data input has now closed, though the online system is still available to enable survey participants to view their data. Thank you to all the volunteers who took part in the survey, and to the House Martin Appeal for the funding. The survey square with most colonies was in the Scottish borders (62 colonies) and the square with most nests was in Hampshire (130 nests). 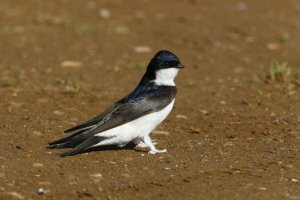 In some areas, House Martin colonies are sparsely scattered, and many volunteers reported empty squares. Although we appreciate that this can be disappointing for surveyors, these results are just as important for producing population estimates as the squares with House Martins. We have completed our analyses of the survey data to produce provisional population estimates and have also undertaken more detailed analyses of the geographical variation in the survey data. These analyses are currently being written up as a scientific paper, and other findings will be reported when the paper has been published. More detailed information about the survey methodology, including the survey instructions and other downloads, can be viewed on our resources page for the 2015 survey.